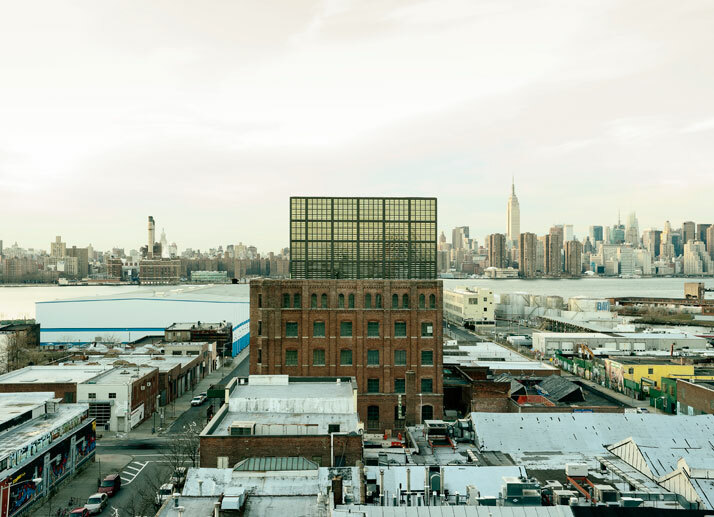 The Wythe Hotel’s location is nothing short of outstanding in the heart of Brooklyn, standing proud on the Williamsburg waterfront. 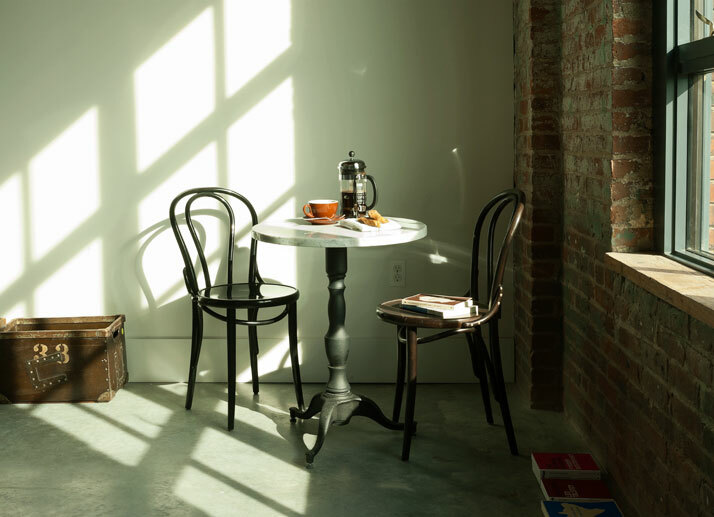 Built in 1901, this former textile factory has been meticulously converted into a 72-room, 8 storey hotel offering service and amenities at a level yet to be seen in this trendy New York borough. A few decades ago Manhattenites, pushed out by increasing property prices, started migrating over to Brooklyn, eventually followed by hipsters, eventually settling in Williamsburg. This area’s seen quite an evolution which inevitably meant a level of gentrification. Gentrification provokes mixed opinions but in one the world's most recognisable and fashionable cities it's inevitable and Brooklyn still holds onto a lot of its gritty history, tightly in its rough palm. 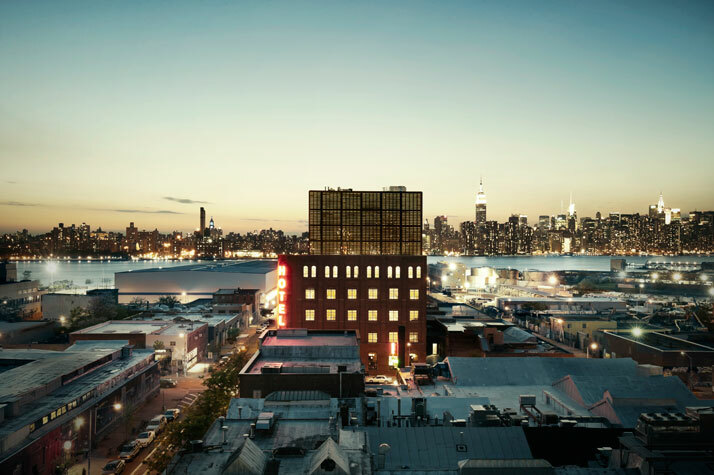 The Wythe Hotel’s an important part of this evolution: a strong example of when gentrification can deliver something outstanding. Since its opening on May 1st 2012, The Wythe’s received an abundance of praise. 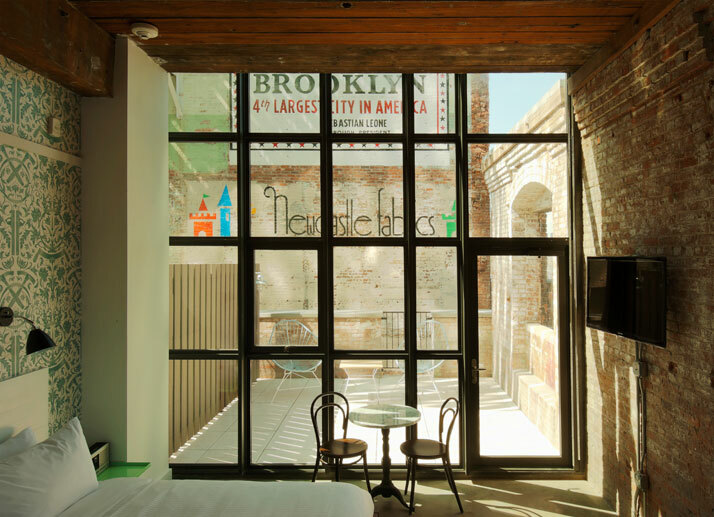 This impressive hotel is a shiny gem in Brooklyn's crown, but not an over polished jewel that shines too bright for its surroundings; as this buildings industrial roots and sturdy urban character’s been beautifully preserved. 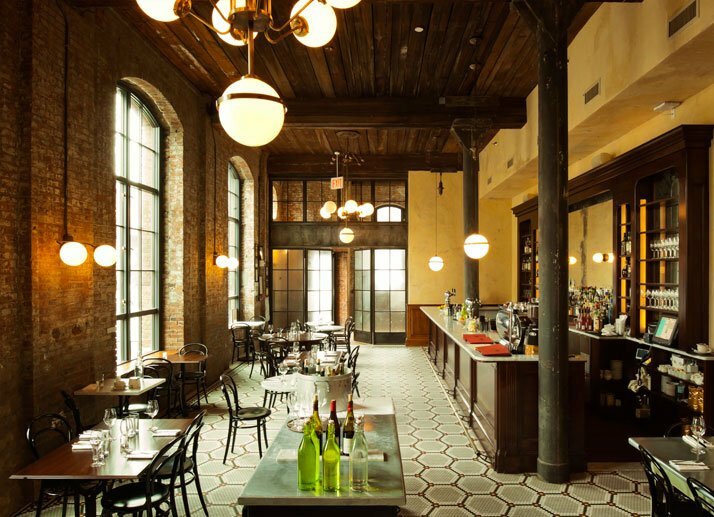 Despite its size, Wythe Hotel's impressive design feels as down to earth as the area it sits in the heart of. 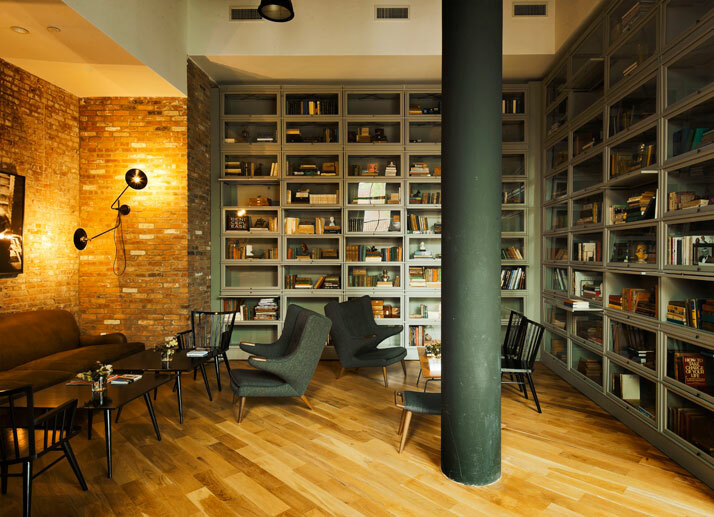 The design of this hotel embraces the original building and surrounding area's hearty industrial charm by showcasing original features such as wooden ceilings, exposed bricks, steel columns and impressive arches. This old familiar building has been sympathetically transformed with care to ensure that it remains relevant amongst its landscape and thereby feels familiar. Its discreet corner entrance ensures that it doesn't seem showy and out of place in an area renowned for its nonchalant laid back cool. 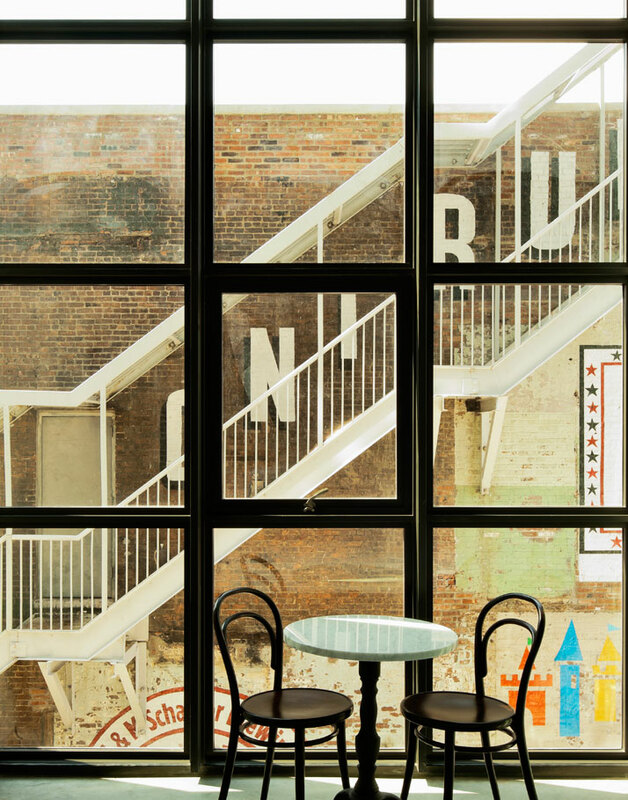 From within, the hotel’s views of old school retro graffiti, urban rooftops and the iconic steel stairwells make the hotel feel part of, embraced even, by its location. 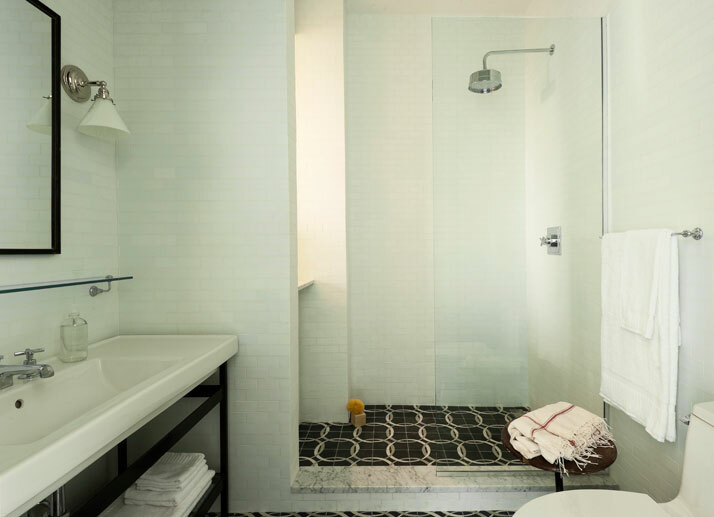 What ensures that this hotel doesn't negatively stand out from its surroundings, is the overall maintenance of a sense of history in what is an overall clean modern design scheme. 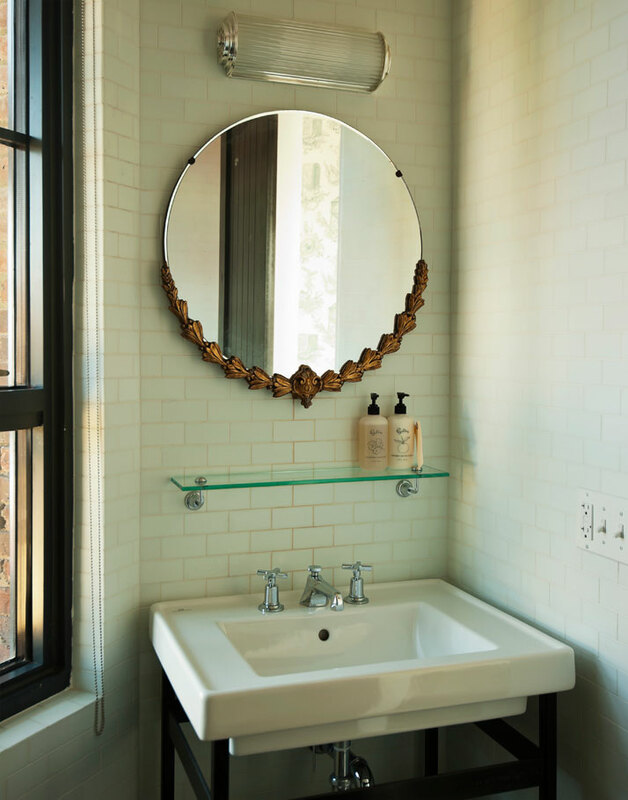 Details, such as traditional sinks, dark wood, and the preservation of original deco tiles, add a quirky and welcoming dimension to this hotel's overall personality. This large, imposing building has a strong character but a soft centre where, despite its sturdy hip physique it encourages you to feel perfectly at home. 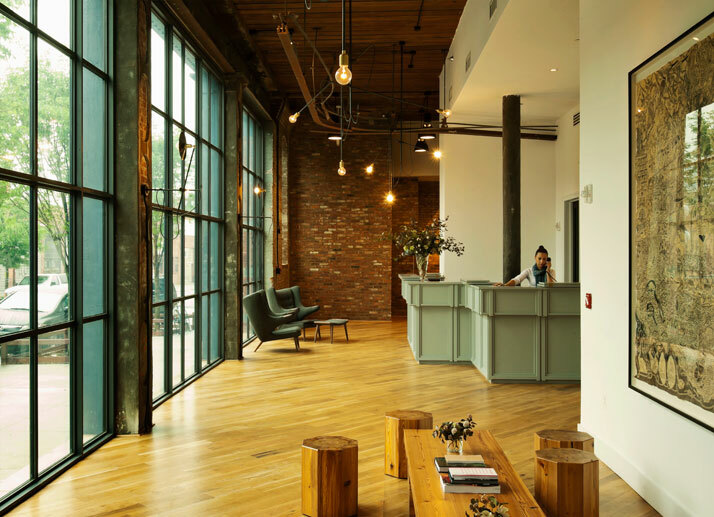 The reception is very modern with wall of floor to ceiling windows, simple and functional lighting - that looks raw and industrial with its wires exposed against the brickwork - and simple timber seating blending into the impressive solid wooden floors. The hotel contains a range of venues that include a main event hall, a private dining room, large guest lofts and a 60-seat screening room. Renowned Brooklyn restaurateur Andrew Tarlow of Marlow & Sons, Diner, and Romans, manages the hotel’s expansive food and beverage program making this a go to place for New Yorkers and visitors alike. The restaurant, Reynards, is extremely elegant, containing a wood-fired oven and grill, and courtyard seating. The beautifully preserved wooden floors and impressive ceiling height add a sense of space while the inclusion of pristine white table cloths, vintage chairs and deco lighting bring a touch of nostalgia. The reception and entertainment spaces also include Ides - a 6th floor bar and terrace with stunning Manhattan and Brooklyn views with a 1920’s Deco feel. 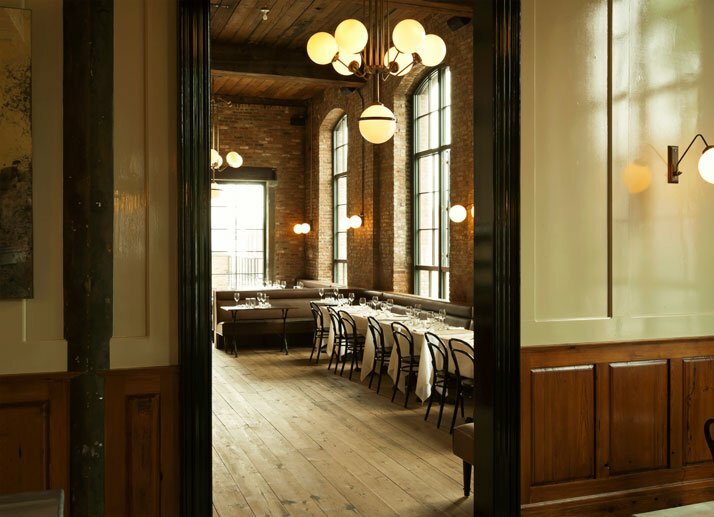 The use of glass in the huge windows and doors floods the space with light in the day, whilst the grand bar stands as a focal point, surrounded by a splattering of tables-in matching dark wood-impressive columns, wooden beams. Stunning spherical lights seem to float like flying saucers, waiting to magically transform the room when the sun sets. The exposed brick coupled with striking panelling, the rugged wooden floor and intricate tiled floors are contrasts that have been enhanced by the use of an earthy, natural colour palette. The modern retro armchairs, large floor to ceiling book shelves and a mixture of lighting features, make the reception space feel eclectic warm and personal. This detail in the design adds interest and a personal dimension to these large industrial rooms whereby there is a real overall sense of authenticity. After an evening spent enjoying the entertainment spaces, the bedrooms, with their neutral décor, are the perfect place to finally rest your head. 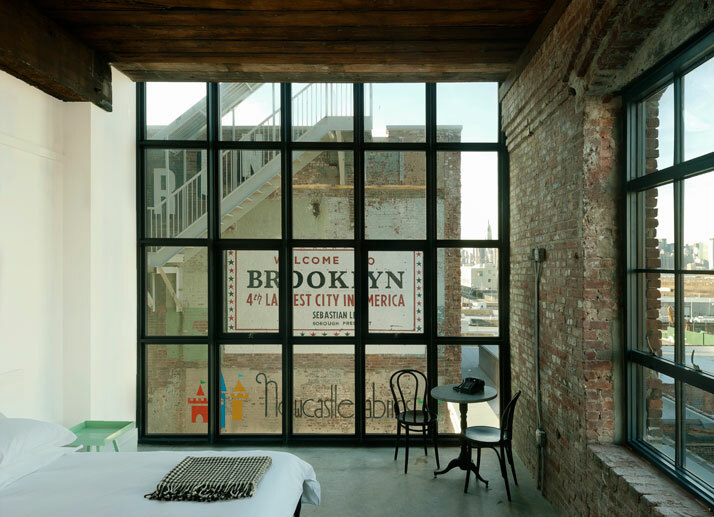 Oversized windows ensure that visitors are fully immersed in the Brooklyn surroundings whilst rough concrete floors and exposed brick walls effortlessly blend the interior with the urban landscape that lies outside. Heated floors and high original wooden ceilings are features that culminate in making these rooms feel like the absolute fashion find. The king room features the signature modern simple furniture that includes custom made beds made from re-claimed ceiling timbers, but introduces traditional wallpaper and breath taking views over Brooklyn factory rooftops towards Manhattan, give this room an edgy sense of opulence. The rooms very much vary in capacity and style, again showing the eclectic and adaptable nature of the hotel’s overall design, and include band rooms and bunk rooms. Each room's different size, shape and aspect has been used to create a character, but they all share a sense of modern functionality that fits with the original building and surrounding area's relaxed vibe. This renovation demands attention for the very best reasons. For the care that's been taken to create it and the amazing design that doesn't scream to be noticed, but can’t fail to be anyway. This hotel is not a limelight seeking diva but a hip Brooklyn gem that feels part of the area’s future. It has a subtly brilliant style and natural substance that effortlessly provokes admiration. 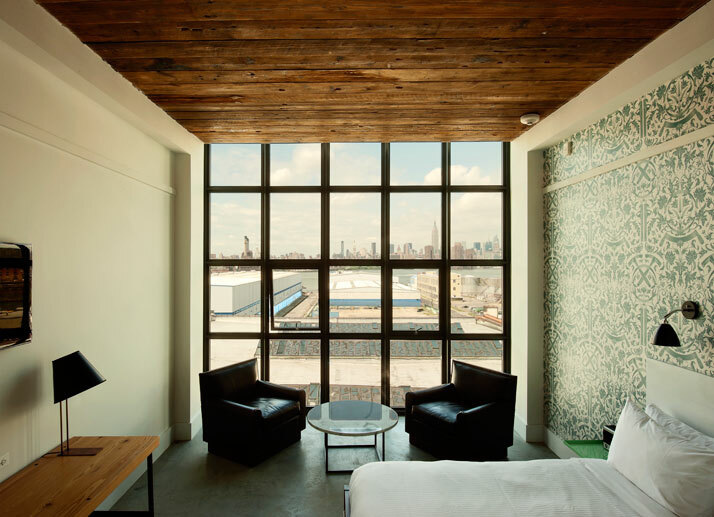 The Wythe Hotel encompasses Brooklyn’s gritty vibe and sense of over-arching authenticity. A stunning but not in the least showy hotel, The Wythe’s like a fashionable old school friend rather than a showy new acquaintance.